At the end of almost every feeder line there are a few more customers that could be fed with a system extension but the cost is prohibitive. It is estimated that there is an average of 2 potential customers within 2000 feet of every end of line. The RF2F comes with a single, dual, quad or 8 outputs to easily and inexpensively extend your system at an average cost of $500.00 per customer. In addition every system has a few potential customers located too far from the coaxial plant to serve. Now with 4Cable’s RF to Fiber taps this becomes easy to accomplish. Simply add the RF2F unit in your feeder line, just as you would a regular tap and then run fiber from the RF2F to your customer’s home. On the side of your customer’s home you use a regular RFoG home unit and now you can easily serve customers up to 10,000 feet from your coax plant. Each RF2F unit includes a low power (3dBm) 1550 nm transmitter, a 1310 receiver, WDM, plug-in changeable directional coupler, and an AC power supply all in a small die cast housing. Options include a 2 output unit with a built in 2 way fiber splitter, a higher output unit with a built in 4 way fiber splitter and a 8 output unit. Perfect for hooking up business customers in business parks. The 4Cable TV RF2F Mini is designed to take the place of a normal RF tap but instead of a coax output , the output is fiber. This allows you to go up to 5000 feet from your feeder line to serve a distant customer. Almost every system has a few places where this unit can be deployed either to serve a new customer or to replace long coax drops with amplifiers that are prone to problems. 4Cable TV’s RF2F (RF to Fiber) field mounted transmitter is designed to accept an RF feed from the HFC coax plant and then output a 1550 nm signal on fiber. The unit has an integrated 1310 return receiver that accepts the return light from the ONU and converts it back to RF and then sends it back on the traditional HFC plant. The receiver is capable of producing a signal with a 30 dB CN with a light input of -26 dBm. Because of the degradation caused by the interaction of the laser Chirp and the dispersion characteristic of the fiber the RF2F can be ordered pre-configured for a fiber length of 5, 10 or 15 km. It has a nominal output of 10 dBm with an option to increase it to 18 dBm. 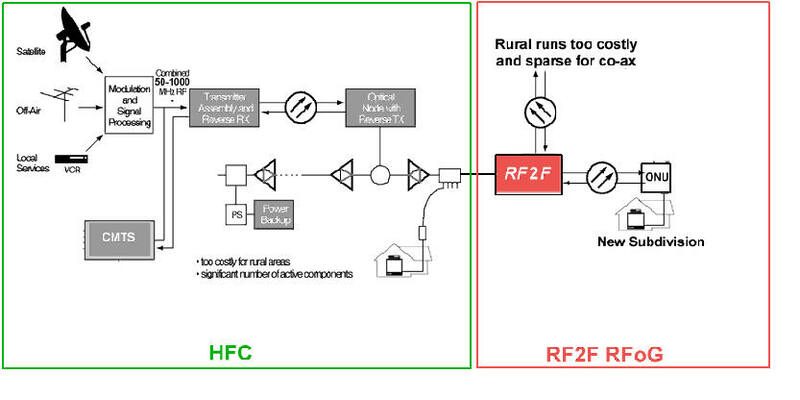 This RF2F is the perfect choice to feed a new subdivision, when fiber is not available, or an extension into a new area. Because of the lower cost of deployment it is perfect choice to use to deploy fiber into a sparsely populated rural area. It is also be available in a low power 3 dBm version to be used to feed long drops to 2 or 3 homes.